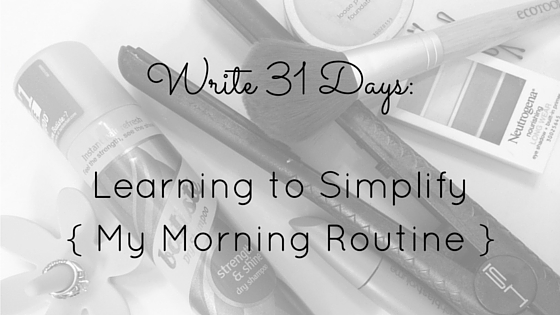 Friends, this Write 31 Days Challenge is GETTING REAL. I have been behind a couple of days, but I’ve managed to catch up so far, and this is technically Day 9’s post. I’ve been talking about simplifying my home, my decisions, and the past few posts have been a bit heavier. So we are going to move back into a lighter topic for tonight. I’m covering something superficial – my morning routine. It’s actually humorous to think about how much time I used to invest into getting ready each morning, pre-baby. Whether it was work, church, or just errands, I washed my hair, then came the blow dry, straighten or curl, (those first few steps alone are like a lifetime for us thick-haired gals) makeup, try on eight outfits, try on three pairs of shoes, and then get my bag together. At least an hour of my life – gone. Fast forward to every day since February 6, 2014, which just so happens to be the day my daughter entered the world, and OH HOW TIMES HAVE CHANGED. A lot of this is because I just care way less. Yes, I still want to look acceptable and decent, and okay, I admit I want to look cute, but if I’m going to be somewhere with my daughter, you can guess where all of the attention goes. And do not get me wrong, this is possibly my favorite thing. I love when people notice her and not me; I am a spotlight dodger while she basks in the glow and waves at her adoring fans. You could say we balance each other. But also, I’ve just gained some perspective on lots of things, and being practical wins out almost every stinking time. 1) Start with shampooing using a quality product. Yes, it really does make a difference. I currently use Bumble and Bumble Gentle and then minimal amount of conditioner (B&B Super Rich) only on the ends of my hair. I do not add any additional products the first day. 2) The afternoon/evening of the first day I pull the top half of my hair into a tall pouf (is that a word? I have no idea. #notabeautyblogger) and secure with a clip. I look 100% ridiculous but no one sees me so whatevs. I try to get as much of my hair away from my scalp as possible. 3) That same night I either sleep with my hair in a loose top knot – literally on top of my head, or just very loosely in a clip – again to keep the hair off my scalp while I sleep. 4) The next morning I do not wash my hair but instead use a GOOD dry shampoo (my friend introduced me to Batiste and I don’t think I’m going too far when I call it life-changing. I buy it at Marshall’s). I also do not brush my hair very much. Only the ends as needed. 5) For the daytime, I typically wear it half up or in a pony tail. If I have time I may curl it, and then I will be able to wait an extra day before washing again. PONYTAILS, TOP KNOTS, BUNS…THEY ARE YOUR DIRTY HAIR FRIENDS. My makeup routine is super quick, and has never been complicated. I stick to the basics, and go for a glowy, fresh look rather than a heavy I’M WEARING MAKEUP look. (I’m just noticing all the CAPS in this post and I apologize for that. They seem necessary at the time.) I’ve also never timed it, but I would guess my makeup is completely done 4 or 5 minutes, tops. If I’m really rushing, I will just do powder, bronzer/blush, eyelash curler (heat it up for just a couple seconds with the hair dryer first for a better curl), and waterproof mascara (more substantial than regular-wear mascara). I always have my outfits picked out the night before. Well, almost always. And when I don’t, I have much less to choose from and genuinely LIKE everything in my closet since I simplified my wardrobe. This saves me SO MUCH TIME. I also prep as much as possible the night before – my bag, Aven’s bag, her lunchbox, her toy bag. And I’m enjoying the perks of having a garage for the first time in my life, so I often go ahead and load the car as well. When I follow this simplified routine, I can be ready to walk out the door in about 35 minutes. Which leaves me with plenty of time to get Aven ready, and if I’m lucky, a little cuddle time on the couch with her before we rush off to start our day. BOTTOM LINE: You can be low maintenance and still look cute! It just takes some preparation and thinking ahead, as well as decluttering the number of tools and unnecessary elements of your morning routine. I repeat: simple and cute is a thing. You should try it.